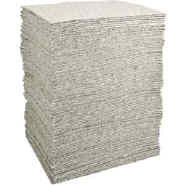 SPC's® Sorbent Pads And Rolls are made with Re-Form™ Sorbent Material, which has a unique composition that is environmentally friendly and absorbs up to 50% more than traditional meltblown polypropylene sorbents. Features netted construction for extra durability, making them a great choice for basic drips and spills - indoors or dry-weather outdoors. And for even more durability, have them try the Re-Form™ Plus versions with the same absorbency performance, but with an added spunbond coverstock for additional strength.